Assorted Notions: Was it all just a dream? For Americans, one of the great things about Miami is that you can get there pretty inexpensively, especially if you use frequent flier miles, but you feel like you've been transported to another country because everyone is speaking Spanish, French, Russian, German, and British English. Plus there are the New York and New Jersey accents which are nearly as foreign to me. 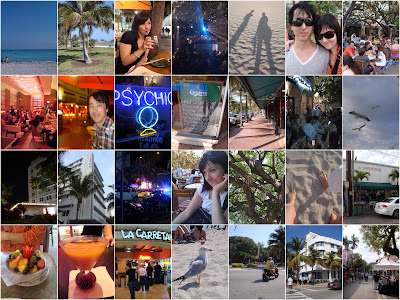 We visit South Beach every other year or so to escape the gloomy Pacific Northwest winter rain. The past five nights went by in the blink of an eye. Now it's back to boots and scarves and long coats. i know!! you came back to a stormy week! good for you to have gotten away! but just think, you could still make a coat! It would pain me to come back from Miami to this dank. I LOVE the photo montage! Christina I’m glad you enjoy yourself in South Beach and you had good weather. Next time you come to Miami and want to take a look at the fabrics and notions stores I will gladly take you. I know what you mean. We went in January and it was heavenly, and almost more languages than you hear in NYC these days. Welcome back! It is so nice to escape even for a bit. How did the pants work out? Glad you had a good time...love the photo montage! So nice you had such a wonderful time. Did you get any fabric shopping in? I love South Beach!! Where did you stay? We stay at the Betsy Ross right on Ocean Drive. I used go down with my husband when he worked the boat show. What a great place I would mve down there in a heart beat. Lincoln Road Mall is great everything is great!! What a great vacation! Now I'm wishing we would've picked somewhere warmer to go for spring break. I love your montage also,looks like the week was well spent....and you always take such capturing pix. BTW I'm having a 7 magazine giveaway, go check if there is anything you like. Really nice pics. Thanks for sharing. I watch CSI Miami just for the sights :) I've been to other parts of Florida but Miami it is next time. Did you find any fabric? Oooooh, I can't wait for my trip next month!!!! Hi Cruz - Thanks for the offer! Next time, for sure! Glad you enjoyed your vacation. I agree with Leslie the montage is lovely. That's a city I'd love to visit. Your pics are great!